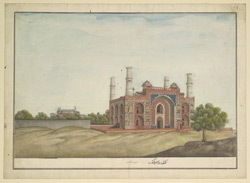 Watercolour, by an anonymous Indian artist, of the entrance gatehouse to Akbar's mausoleum at Sikandra, dated between 1820-25. The mausoleum is in the background of the image. It is inscribed on the front in Persian characters, 'Naqshah i darwazah i Sikandrah' (Picture of the gate of Sikandrah), and on back in English, '12. The Gateway at Secundra.' The village was named after Sikander Lodi (1489-1517) the king who established his court at nearby Agra in 1504. The mausoleum of the Mughal emperor Akbar (r. 1556-1605) is set in a large square garden surrounded by battlemented walls with a red sandstone gateway at the centre of each of the four sides. The main entrance to the mausoleum comprises a high arched gateway flanked by recessed arches and interior chambers. Its surface is inlaid with white marble floral motifs and tessellated coloured stone patterns and has an inscription from the Quran, the Surah-i-Mulk. There are four three-storeyed marble minarets at each corner of the gateway, the first of their kind built in India. The mausoleum itself comprises a series of tiered storeys culminating in a white marble pavilion at the very top. The burial chamber lies deep within the building and on the top floor is a replica tomb, placed exactly above the grave further below, carved from a single block of marble and inscribed with the ninety-nine names of Allah. During Akbar's reign he encouraged a synthesis of Hindu and Islamic artistic traditions and his tomb may be seen as a culmination of this style. The building remained unfinished at his death and was completed by his son Jahangir.